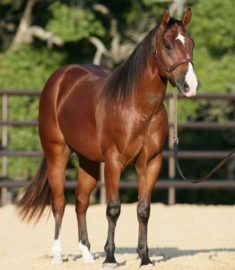 Clayton was cloned from Gills Bay Boy (Scamper), a bay Quarter Horse purchased from a feedlot by Charlie James for his teenage daughter Charmayne. The rest, as they say, is history. Charmayne James and Scamper became superstars of the rodeo, winning 10 consecutive world Barrel Racing Championships from 1984 to 1993. Famously, Scamper won the 1985 National Finals Rodeo without his bridle after it accidentally came loose. In 1992, James was inducted into the National Cowgirl Hall of Fame, and in 1996, Scamper was inducted into the Pro Rodeo Hall of Fame. In 2006, James decided to clone the legendary 29-year-old gelding in order to continue to use his exceptional genetics in her breeding program. “If there was ever a horse to be cloned, Scamper’s the one,” said James. Clayton, born August 6, 2006, lives on James’ Ranch in Boerne, Texas, where he stands as a stallion. His first crop of foals was born in 2009.